The Alliance Theatre is joining forces with UNICEF USA to provide arts-based, interactive workshops designed to raise awareness and improve the lives of children across the globe. This event, which is free and open to the public, will take place at the Woodruff Arts Center on Sunday, September 30 from 1:00 to 4:00 p.m. Using storytelling and theater, families will work together to explore practical solutions to some of the world’s most difficult humanitarian problems. With special hands-on programming provided by Challenge Island HQ, families will brainstorm solutions to global issues through STEAM activities. The event will culminate in a peaceful demonstration called "Get Up Stand Up," which lets kids lift their voices against some of the injustices children face around the world. 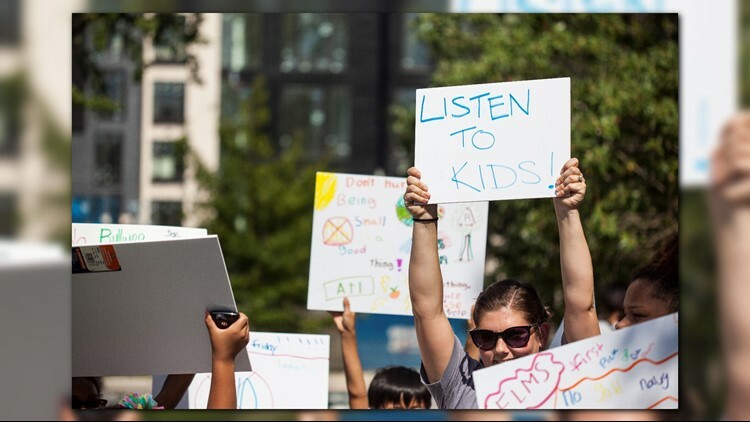 "UNICEF USA is so excited to partner with the Alliance Theatre on a free day of fun and learning for children and families, giving kids a voice and empowering them to become active global citizens," said Jeremy Cole, Managing Director of UNICEF USA. The program has a special focus for Girl Scouts, who will be able to earn badges for their participation. "Get Up Stand Up" is a peaceful advocacy experience for families presented by the Alliance Theatre. It's inspired by the work of the Smithsonian Early Enrichment Center and the wave of national marches in recent years. It begins with a 30-minute session with a teaching artist, who will lead families in a conversation about issues that children find most important. Then, participants create protest signs against issues ranging from wearing school uniforms and eating vegetables to world hunger, racial and gender disparities and many more. The event will end with a peaceful protest on the Woodruff campus.